I recently had the opportunity to make a presentation at a federal judges’ conference in New Jersey that brought together judges and lawyers from that state. About 300 lawyers attended, as did about two dozen federal judges. The subject of my presentation was storytelling and its role in trials. After my presentation was over, I informally polled the judges in the room on their views concerning the importance of visuals at trial and the role of storytelling. Every single one of the judges, with the possible exception of one bankruptcy judge, indicated that he or she thought that the use of demonstratives was a critical part of any trial presentation. This is a notable indication, if an unscientific one, that judges, who are key decisionmakers in any courtroom, understand the role of visual persuasion. I would add a caveat. They are judges, after all, and I have little doubt that they will sua sponte reject a trial lawyer’s effort to tell a story visually that in the judge’s view is inherently unfair to the other side. 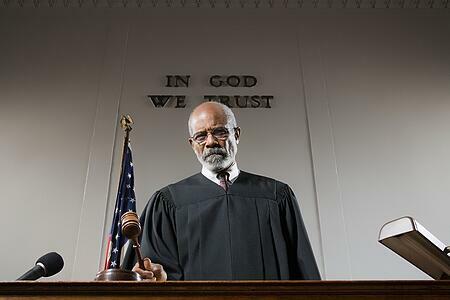 Judges will control what goes on in the courtroom when it comes to the use of demonstratives as part of your narrative, as they will in every other aspect of a trial. That means that, as we said in our most recent post, trial lawyers should always have a backup plan in mind, a “Plan B” in case the judge views their original approach as objectionable. But the results of my informal poll are consistent with what we at A2L have been saying for the past several years here. Jurors are human beings who learn best when they learn visually, and they understand a case the most instinctively if it comes to them in the form of a story. Using Litigation Graphics in Bench Trials: How Different Is It From Jury Trials? Storytelling at Trial Works - But Whom Should the Story Be About?